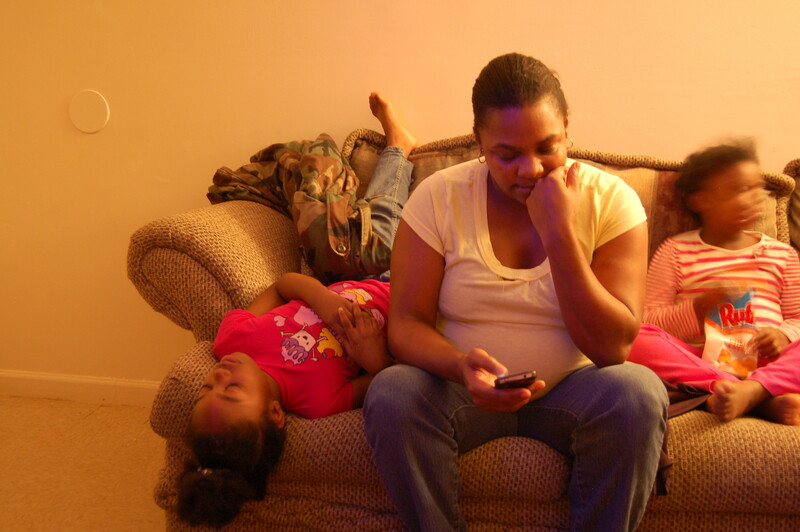 WAKE FOREST, N.C. -- Janette Simon has four chicken legs and five kids to feed. Her freezer is bare. And her latest trip to the food pantry yielded little else for dinner this night: a bag of day-old croissants, a box of Corn Flakes, and some canned goods. She slathers barbecue sauce on the chicken, slides the pan in the oven, and begins her nightly ritual of distracting her five children from hunger. On the 13th of every month, she has counted on seeing a $600 payment on her food-stamp debit card. But now, that payment is a month late. Simon and thousands like her in North Carolina had enough to worry about before a computer glitch began to fray this basic part of the social safety net. Last July, government computers across the state repeatedly crashed, preventing caseworkers from processing food stamp applications and recertifications for weeks. Eight months later, North Carolina officials are still scrambling to clear the resulting backlog. The food stamp delays can be traced to troubles with a computer system designed by Accenture, one of the world’s largest consulting firms. The company is among a small group of politically connected technology contractors that receive government business across the country despite previous criticism of their work. Accenture won the North Carolina contract after spending thousands of dollars on political contributions and lobbying in the state. North Carolina hired Accenture even though at least six other states -- Colorado, Florida, Wyoming, Kansas, Wisconsin and Texas -- have canceled contracts with the company in the past decade over problems with its computer systems. The glitches in North Carolina mark another example of government technology gone awry, turning a program created to sustain millions of people through hard times into a new aggravation. The high-profile failure of the federal health care exchange last fall illustrated what many low-income people have encountered for years: faulty computer systems and websites that prevent them from receiving public assistance on time. But the backlog kept growing. By the end of last year, more than 30,000 families in North Carolina had waited more than a month to receive food stamps -- a violation of federal rules that require routine applications be processed within 30 days. About one third of those families had waited three months or more. The U.S. Department of Agriculture, which oversees the federal food stamp program, has threatened to take a rare and drastic measure: cutting off $88 million in funding to North Carolina if the state doesn’t clear the backlog of cases by March 31. She said the state met an initial federal deadline in February to process the longest-waiting food stamp cases after a “herculean effort” by government employees. “As we approach the USDA’s March 31 deadline, the counties and state are continuing to work tirelessly to meet federal timeliness standards,” Wos said. Last week, Wos said county and state officials expect to meet the deadline. About 1,000 food stamp cases were still considered to be “untimely” by federal standards, according to state figures released last week. 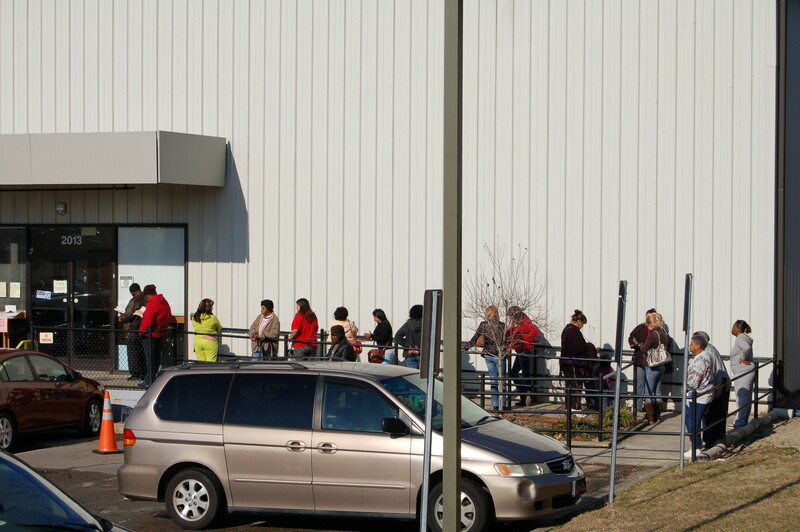 North Carolina officials blame the food stamp delays partly on Obamacare. Under the health care law, states were required to update their aging computer systems to accept Medicaid applications by Oct. 1 of last year. North Carolina chose to combine food stamp, Medicaid and other welfare programs into a single computer system. When state officials updated the software in July to comply with the law, they did not have time to properly test the system and ran into glitches that created the food stamp delays, according to Julie Henry, a spokeswoman for the state Department of Health and Human Services. But the USDA has dismissed the state’s explanation, noting in a January letter that many other states complied with the federal health care law “without the dramatic impacts” on food stamp processing that occurred in North Carolina. For many already struggling families, those impacts have taken a toll. Camilla Lewis, a 29-year-old single mother in Raleigh, said her $216-per-month food stamp payment stopped arriving in November, around the same time she lost her job as an administrative assistant at a local law firm. Doctors diagnosed her 2-year-old son, Jamarri, with a digestive illness and told her not to feed him processed food. But without food stamps, her only options were low-priced items like chicken nuggets and instant mashed potatoes, she said. In late February, she received back payments for the three months food stamps had not arrived. Still, Lewis said state officials “don’t seem to care” about families like hers. The problems in North Carolina are not unusual. In recent years, computer errors have disrupted a wide range of government-run programs across the country, including Medicaid, unemployment benefits and child support payments. Food stamp recipients have been hit especially hard. In October, families in 17 states were unable to use their food-stamp debit cards for several hours. Many had to abandon their shopping carts at the grocery store. Xerox, which manages the cards in those states, said a test of a backup computer system caused the glitches. In 2004, Colorado’s computer system mistakenly denied food stamps to residents unless they held a driver's license from Guam. Last fall, a contractor for the Georgia Department of Human Services wrongly terminated food stamp benefits for 66,000 people after failing to send them renewal notices in time. Such errors happen for many reasons, experts say. States are short-staffed and lack technology experts. They rush out new computer systems before the systems are ready. They fail to oversee IT contractors. The glitches often take months or even years to fix because technology for poor people is not considered a high priority, according to David Super, a Georgetown University law professor who studies government technology projects. After hiring dozens of engineers and programmers from tech industry giants like Google and Oracle, the federal government largely fixed problems with the health-care website in about two months. But many states have taken much longer to fix computer errors with welfare programs. Colorado’s troubled system for food stamps and Medicaid has been plagued by glitches and delays for the past decade. Accenture’s job in North Carolina was to customize software made by an Irish company called Curam, which is owned by IBM. Once part of Arthur Andersen, Accenture had more than 4,000 clients in 120 countries in 2012 and made $28 billion in revenue that year. Accenture employees have given at least $57,000 to political candidates in North Carolina since 2002, according to state records. The firm also spent about $87,000 on lobbying in North Carolina in 2010, the year it won the state contract. It is not unusual for government contractors to spend money on lobbying. But Accenture has hired some of North Carolina’s most influential insiders to promote its interests, according to rankings of state lobbyists compiled by the nonpartisan North Carolina Center for Public Policy Research. One Accenture lobbyist, Charles Neely, is a former Republican member of the North Carolina General Assembly. Another, Angie D. Harris, served as deputy chief of staff to then-North Carolina Gov. Jim Hunt (D). Rick Webb, a former Accenture lobbyist who is now the company’s managing director, previously served as head of the Office of Information Technology Services, the state agency that oversees government IT projects in North Carolina and approved the contract with Accenture. Accenture was chosen because it “met the needs” of the planned computer system, a spokesman for the state Department of Health and Human Services told HuffPost. Despite the glitches, North Carolina continues to work with Accenture. But other states have cut ties with the company after troubled technology projects. In a scathing 2006 report, Texas Comptroller Carole Keeton Strayhorn found numerous problems with Accenture's work managing a state computer system that processed applications for the Children’s Health Insurance Program (CHIP) as well as food stamps and Medicaid. After Accenture took over the Texas system in late 2005, families reported delays and inaccuracies in processing applications and CHIP enrollment fell by 8 percent, or more than 27,000 children, Strayhorn found. The project was also behind schedule and $100 million over budget, according to her report. “Many cases show eligible children are losing health care coverage through no fault of their own, but due to mistakes and errors made by Accenture and its subcontractors,” wrote Strayhorn, a Republican who ran unsuccessfully for governor in 2006. Texas canceled its contract with Accenture in 2007, and a subcontractor, Maximus, took over the project. Since then, the state has seen “a dramatic reduction in error rates” for processing children’s health insurance applications, according to Stephanie Goodman, a spokeswoman for the Texas Health and Human Services Commission. And yet, Accenture continues to win new government business. In addition to hiring those Google and Oracle employees, the Obama administration awarded a $90 million contract to Accenture this year to take over management of the federal health insurance website. In a statement to HuffPost, Accenture defended its work. “Looking in isolation at a small subset of Accenture’s past engagements over the last decade or more that had challenges and trying to argue a conclusion about our performance is simply not accurate,” company spokesman Jim McAvoy said. McAvoy disputed the claim that Accenture’s project in Texas went over budget and said the company has “successfully worked, and continues to work,” for many state government agencies in Texas over the past decade. He said Accenture also has a “long and successful track record” in North Carolina and is helping the state address the food stamp system’s “challenges.” But some have questioned why North Carolina chose Accenture to build the computer system. Accenture was the only company to bid on the contract. North Carolina officials could have reached out to other companies, however, if they felt that Accenture was not right for the job, according to State Auditor Beth Wood, whose office is investigating the food stamp delays. In 2009, Computer Sciences Corp. won a $265 million contract with North Carolina to build a new computer system for Medicaid claims. That computer system has been plagued with problems as well. In January, a group of North Carolina doctors sued the state, the company and other contractors, alleging that the glitchy technology had severely delayed thousands of dollars in Medicaid reimbursements. Like Accenture, Computer Sciences Corp. had hired influential lobbyists in North Carolina. One of them, Lanier Cansler, was the former deputy secretary of the state Department of Health and Human Services. Shortly after the company won the contract, Cansler returned to state government when then-Gov. Bev Perdue (D) named him to lead the state health agency that oversaw the contract. Several other government technology contractors -- including IBM, Deloitte and Hewlett-Packard -- have likewise come under fire for problems with systems they built for delivering welfare and unemployment benefits. Technology was supposed to make life easier for North Carolina’s 1.7 million residents on food stamps. Under the state’s new computer system, families would no longer need to fill out multiple applications to apply for aid and caseworkers could spend more time helping them and less time on administrative tasks, state officials promised. Plus, the federal government was picking up most of the $187 million cost of the technology. State officials called the system North Carolina Families Accessing Services through Technology, or NC FAST -- an acronym that suggested food stamps would arrive without delay. But the new technology required “a big learning curve” for caseworkers who were already struggling to handle caseloads that had doubled since the recession, according to Liz Scott, the assistant human services director in Wake County, which includes Raleigh. North Carolina is no stranger to technology blunders. In December, the state accidentally mailed 49,000 children's Medicaid cards with their private medical information to the wrong addresses. State officials blamed the privacy breach on "human error in computer programming." Wood, the state auditor, said North Carolina’s tech problems have been the result of “poor planning and poor monitoring.” For years, she said, the state has lacked staff who understood complex IT projects, resulting in lax oversight and weak contracts that didn’t hold companies accountable for their mistakes. In a review of 84 government IT projects in North Carolina over the past decade, Wood found that on average, they cost twice as much and took one year longer than originally estimated. Such problems are not unusual. From 2004 to 2013, only 5 percent of government IT projects were considered “successful,” according to the Standish Group, a research firm. The rest were delayed, came in over budget, or were completely abandoned because they didn't meet expectations. The food stamp delays have left North Carolina’s food pantries “busting at the seams” with hungry families, said Terry Foley, director of Catholic Parish Outreach in Raleigh. One of the state’s largest food pantries, Catholic Parish Outreach served 11,000 people per month last year -- an 11 percent increase from the year before. Foley attributed the surging traffic to the food stamp delays and recent cuts in unemployment insurance. Due to high demand, Catholic Parish Outreach has been forced to reduce the amount of food it gives families from a seven-day supply to a five-day supply. Another local pantry, Wake Relief, has cut how often it serves families from once every 30 days to once every 60 days. 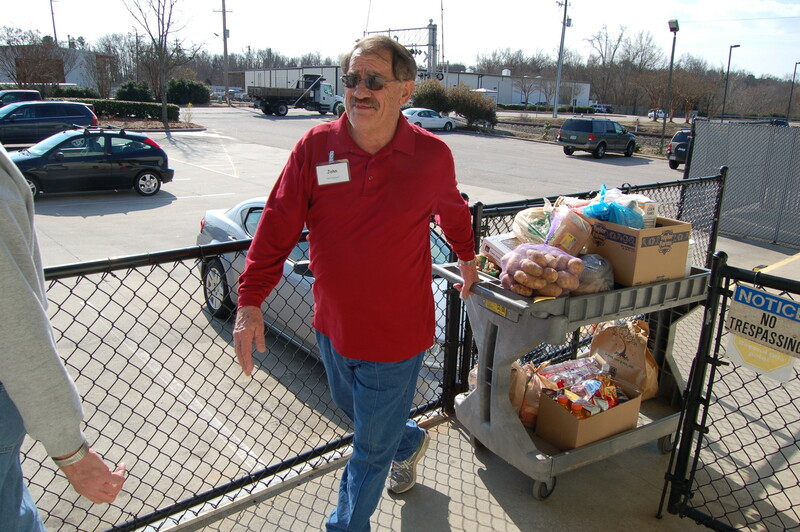 Ken Chapman, 54, of Raleigh, recently visited a food pantry because his $180 monthly food stamp payment had not arrived since October. Chapman earns $50 a day digging ditches and removing debris as a temporary laborer. He mostly eats bologna sandwiches and items from McDonald's dollar menu. 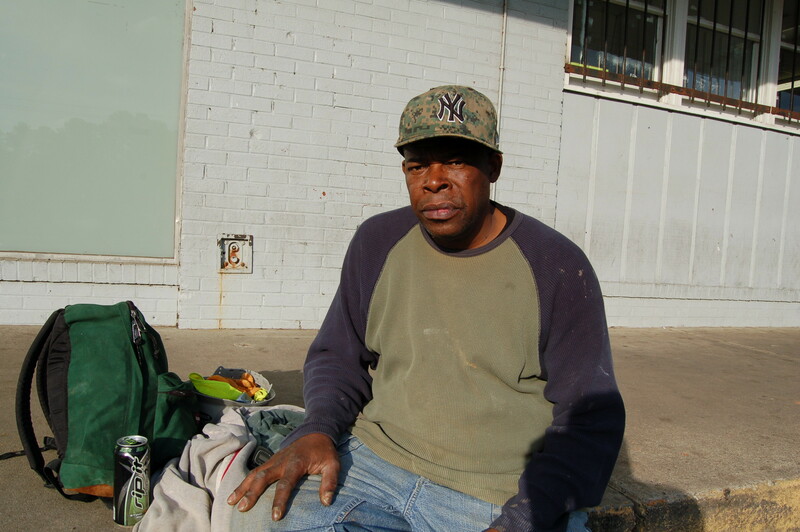 “I'm not starving, but I'm about to starve,” he said while sitting on a curb outside a temp agency office in downtown Raleigh, his hard hat and blue jeans streaked with red clay after a long day’s work. He struggles to explain his situation to his two daughters, who are college graduates. Chapman has turned to friends, but the ritual has become “degrading and embarrassing,” he said. On a recent morning, the line outside Catholic Parish Outreach began to form an hour before the doors opened at 10 a.m. Over the next four hours, more than 100 families signed in at the front desk and waited for their number to be called. In the waiting room, mothers whispered in Spanish to crying babies while sorting through bins of donated toys and clothes. Several people took fliers listing information on emergency shelters and crisis hotlines. Volunteers checked to ensure that each family had an official referral and had not visited the pantry within the past month. In a nearby warehouse, jars of peanut butter and cans of green beans were stacked 10 feet high. A sign on a walk-in freezer read, “Meat Distribution: 1 pound per person. Family 4+ use large meat as necessary.” Volunteers stacked bags of potatoes, boxes of cupcakes, and canned goods onto carts and then loaded them into families’ cars. "It's very hard to meet all the needs of the community when clients' food stamps are delayed," said Foley, adding that many recipients have been forced to choose between paying for food or utilities. "They might decide to have the heat turned off in their apartment or have their water turned off,” Foley said. “Those are the decisions people are making."